Thermo Fisher Scientific offer a wide range of instruments for measuring and monitoring algae. Online detection of chlorophyll concentration, algae classes and photosynthetic activity. Distinction of green algae, blue-green algae (cyanobacteria), diatoms and crytophytes in a flow-through chamber - simple, quick and reliable. Determination of chlorophyll concentration, algae classes and photosynthesis activity for scientific and routine analysis. The bbe AlgaeTorch is a lightweight instrument for the simultaneous quantification of the chlorophyll-a content of cyanobacteria and the total chlorophyll content of microalgae in water. 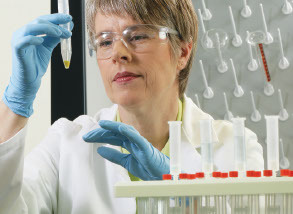 The measurement of chlorophyll-a can eliminate laborious sample preparation in the lab. A complete measurement needs less than 20 seconds. No sampling or preparation is necessary. The bbe FluoroProbe is a highly sensitive measuring instrument for the analysis of chlorophyll with algae class determination. Individual profiles during the measurements are taken for green algae, blue-green algae/cyanobacteria, diatoms/dinoflagellates and cryptophytes. The bbe BenthoTorch is a cost-effective tool which enables real-time measurement of benthic algal concentrations. It is a portable field instrument for the in situ quantification of chlorophyll-a fluorescence on different substrates such as stones and sediment. Detect harmful algal blooms faster and improve sensitivity of tracer studies using sensors with patented integrated optical compensation. This technology prevents instrument drift and provides more stability at lower detection limits for better data overall. Available sensors for Aqua TROLL 500 and Aqua TROLL 600 Multiparameter Sondes include Rhodamine WT, Chlorophyll a, Phycocyanin (BGA-PC) and Phycoerythrin (BGA-PE) Sensors.